Here is a lovely PDF example of a full-on Waldorf circle: Cobbler Circle by Christina Assirati. Nancy Foster explains circle plays and gives a few words of caution in the forward of her book Let Us Form a Ring: An Acorn Hill Anthology (link is to WaldorfBooks.com; Angela Guzzo also carries the matching two CD set). It might be helpful to mention, however, that each song or verse in a circle play should generally be repeated, at least once, and possibly more when the play is still new to the children, in order to give them a chance to enter into the music or words and gestures. Otherwise it goes by so fast that they become lost and frustrated. It is also often a good idea to introduce the play gradually over a period of several days or a week, so that the children are not confronted with too much new material to digest at once. This is not to be done in the conscious way of "teaching" something new, as in a rehearsal; rather, the new material can be gradually incorporated into what has already become familiar. Then as new material is added, the old can be left off until the children are fully "in" the entire circle play. How this is specifically worked out by the teacher will depend, of course, on the age of the children in the group. Finally, it should be said that these circle plays are not offered as "finished products;" I find that I keep re-working them as I learn more about this way of carrying out a circle. They are offered, rather, as working models, to encourage teachers to try them and above all to try to compose their own! The "Orchard Circle Play," which is not in the mood of the fifth, is an example of how one can use already-existing material on a theme, unifying it into a circle play by means of connecting rhymes. 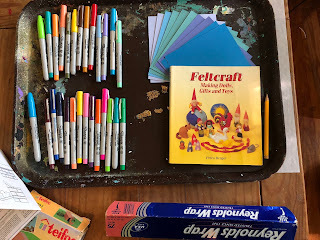 We are going to use connecting themes of the animals and flowers in the meadow to gradually transition from traditional picture books and activities to a true Waldorf circle. This one is composed by Laurie Clark and found in Movement Journeys and Circle Adventures, volume 1 (volume 1 and 2 can both be found at the link provided to WaldorfBooks.com). From there I will work on composing my own seasonal circles. I also want to warp my tapestry loom for our new classroom collaborative weaving for 2018-2019, which will be of a meadow. I will need to weave the header rows in dark brown for several inches of the soil before children can start to add their colors and contributions. Again, if I get older siblings at some point along here, I have materials from Waseca Biomes which would be helpful (like the Parts of a Biome and Layers of the Soil three-part cards and Part of a Biome jars). With older kids the book One Small Square: Backyard would also be great! have a tea party outside, look for four leaved clovers, drink some tea and eat your fresh hot biscuits with butter and clover honey! do complete "Sunflower Circle" by Laurie Clark! I have two back posts to write: my notes from the end of the school year, and my notes from Zac's birthday and our trip to the Waldorf School of St. Louis for their Little Red Hen Baking Party. But right now I'm really excited about the deep clean of my garage. It's no longer a garage... I finally have an Art Room! Yes, folks, now I have a house with a Library and an Art Room! I am tickled pink. It is pretty funny to see the space gradually turn into a school. And I absolutely love it. As a matter of fact, the more it becomes like a school, the happier I am here. June 1st is the start of my Mommy & Me summer activities, called Picnic & Play. I am very inspired by my trip to the school in St. Louis, and want to add songs and routines to make our activities even Waldorfier, but I also know that learning a bunch of new songs -- and teaching them to parents -- will be more successful if we do it slowly over time. So I have to be content with being more traditional as we start out and gradually getting more Waldorfy. That being said, this summer is going to be an awesome time of getting to know my early childhood kids and their families, spending time with Zac doing new things, and organizing my house so that it finally looks the way I want it to AND I can find everything!!! The first story I'm feeling really inspired by is Wombat Stew. As soon as I read it to Zac, I thought, "This would be GREAT for a sensory table activity." So we are going to do a couple of days worth of Australia & Oceania things. There will be a variety of ages of kids coming to Picnic & Play, so I am just going to start by noting everything I have that would be at all relevant. Wombat Stew contains lots of animals (dingo, wombat, platypus, emu, blue-tongued lizard, echidna, koala bear) and lots of ingredients to add to the stew (mud, feathers, 100 flies, slugs & bugs & creepy-crawlies, gumnuts). learn and sing "Don't Ever Step on a Snake"
sing "Kookaburra" and "Don't Ever Step on a Snake"
learn and sing "Waltzing Matilda"
sing "Kookaburra" and "Don't Ever Step on a Snake" and "Waltzing Matilda"
I have a wonderful new Waldorf kindergarten cookbook and I can't wait to try my very first recipe from it! It's called Pumpkin Soup and Cherry Bread: A Steiner-Waldorf Kindergarten Cookbook. Arranged seasonally, this book includes three Spring recipes which feature carrots: Carrot soup (p.44), Carrot curry (p.46), and Carrots with satay sauce (p.48). This is a great cookbook which contains, as you would expect, inspiring pictures of a Danish Waldorf kindergarten classroom including foraging and cooking outdoors, helpful information about how to include fresh seasonal produce in all aspects of your curriculum, and details about how they run their school. However, this book is uniquely helpful because each recipe's ingredient list is given twice, to be the correct amounts for a family of 4 AS WELL AS for a classroom of 40 children. I wonder sometimes what I will find to blog about when I'm not in the weeds of constant lesson planning. Between all the main lesson blocks I've taught to the mixed ages I'm working with, plus tutoring and after school clubs, it seems like every single book I see is one I want to remember about for an upcoming MLB, or wish I known about for a recently completed lesson. But an author/illustrator I've really become fond of lately is Albert Lorenz. It all started with House. I bought this book, according to Amazon, on November 18, 2005. That means that Becca was ten months old, Leah had just turned two a few days before, and Natalie was three. WHY, you ask? Because I was determined to be a Waldorf homeschooling mom and someone recommended it on a Yahoo group as being useful for the Housebuilding block. Fast forward to May 2018. For the first time in thirteen years, I used this book. It has been on my shelf all this time... then I finally got it down for my Housebuilding block and I love it! Country People, peasant cottage in Flanders mid-sixteenth cent. Dutch Masters, Dutch merchant mid-seventeenth cent. Curious to see what else he'd written, I checked out Metropolis. Loved it. Bought it. Again, so useful for so many main lesson blocks! Excited by his work, I continued to check out books. Amazon had very mixed reviews of The Trojan Horse so I checked it out from the library instead of buying it sight-unseen, and I'm really glad I did. (You can read my two star review at Amazon.) But I also discovered he wrote Journey to Cahokia and that was one I decided to buy after checking it out and reading it. This is a narrative story about a boy named Little Hawk and although Lorenz clearly did his research, he is not as good at writing fiction as he is at straight non-fiction (in my opinion). I would NOT have bought this book if I didn't live in Illinois, where we teach about and visit Cahokia on a regular basis. But it's fun that my kids can see landmarks they recognize on the map in the introduction, it's useful that it gives more of a sense of what it would be like to walk around in that city when it was at its peak (pair with Bonnie Shemie's Mounds of Earth and Shell), and it is definitely a must-own if you're in Illinois or Missouri and teaching grade 4 Local History & Geography. Our most recent Albert Lorenz purchase arrived on Tuesday and this one I did buy sight-unseen based on the glowing Amazon reviews. It's out of print so you have to get used copies and mine was missing the magnifying glass, so be prepared for that. It's called Buried Blueprints and I could barely get my 14 year old daughter to give it up so that I could write this blog post. She LOVES the detail in the illustrations (thus the magnifying glass). "I got the material for this drawing from a blind street singer in Athens named Homer." He has requested soup, bread, and pie for his birthday dinner. And he wants to have his good friend and her family over for the birthday dinner. Adorable. So sweet and simple. I can get a pie from the bakery and pop some soup ingredients into the crockpot that morning, go to Natalie's art show from 4-4:30 pm, and still be back in time to host a birthday meal at 5. Obviously, we will need to set up the birthday ring. We've had that ring since Natalie was a baby. I got it for her first birthday, back in 2003. And we've been working on our collection of ornaments ever since. I also love the idea of turning the magnolia into a ribbon tree! He is getting a ton of gifts from me because three is such an exciting age, and his play has advanced by leaps and bounds lately. For one thing, he's overcoming his sensory defensiveness with mud and that's a huge thing to celebrate. We have recently dug a deep digging pit in one corner of the yard... and he loves to pour water into it and poke the mud with sticks. Today for the very first time he stood in the pit. Hooray! So... a fully stocked outdoor mud kitchen with pots and spoons and muffin pans and whisks, etc. is the obvious next step. In addition to the kitchen tools, we will be stenciling black circles on an old bench with paint, to be the "stove burners." Beyond adding a mud kitchen for outdoor play, I'm putting down smooth river rocks where we have a bare area in our lawn, to make a dry streambed for imaginative play. The guy who mows my lawn probably won't be thrilled, but there's no grass there so why not have a pretend stream? I saw one at a Nature Explore playground in Maryland and never forgot it. Such a simple idea that sparks so much creativity. Indoors, Zac is getting a Jonti-Craft Light Box. I'm so excited!!!! I also have light table things ready to go in little bins below the coffee table. Also in indoor play, he's getting a few Fagus wooden vehicles from Nova Natural. We have the car carrier and he loves it, so I got him the tractor, horse trailer, and hay wagon. And I'm making him a ton of hand sewn wool felt foods. He has started making soup constantly in his play stands (bringing me pot after pot of colorful wooden blocks) and so I think it is time. Every evening after the kids go to bed I stay up sewing, creating patterns based on pictures on Pinterest which I think I can replicate. Of course some foods are just simple circles! For the sugar cookies I used my Kool-Aid sprinkle dyed wool felt for the icing and little glass seed beads for the candy sprinkles! I've been so successfully using up my wool felt scraps (and some of my thread, leaving me with handy-dandy vintage wooden spools for crafts) that I am going to need to purchase a new wool felt assortment. I've gotten the one from Magic Cabin three times, and now I'm interested in the one at A Child's Dream Come True, which is 74 colors of merino wool felt for $185.00. We started this week's tutoring session by building with the little bricks and cement from the Teifoc kit. The cement comes powdered and you mix it with water to reconstitute. The ratio is 6 tablespoons of cement powder to 2 tablespoons of water. After you've built your structure, you can soak it for five hours to dissolve the cement and then dry and reuse the bricks. We talked about the patterns in brick building (this is covered in more detail in the Waldorf 3rd grade Shelters block, especially in Roy Wilkinson's book for Farming, Gardening, Housebuilding) and how it is important to make your structure stable. Then we reviewed the story The House That Ate Mosquito Pie and added a summary of it to the main lesson book along with the stamped brick illustration of the house with two chimneys from last week. I also gave him his dry piece of flat wool felt from last week. I asked him if he remembered the animal which the wool was made from (sheep) and if he remembered the other animal we talked about which was large and shaggy. I read him the "On the Menu" poem for the letter Y from Phonic Rhyme Time, and he remembered that the name of the animal was "Yak." We drew a long line for the yak's long snout and then two short lines protruding from the top for the horns. We also updated his MLB with the L is for Ledge and D is for Dragon from the previous session. When we put the crayons back in the box, we counted them to make sure they were in order and he went on and spontaneously counted all the way to 30, which was a big achievement! Then it was time for a new story. I asked him if he had ever been camping, and we talked about that for a bit, and then we read Where the River Begins by Thomas Locker. 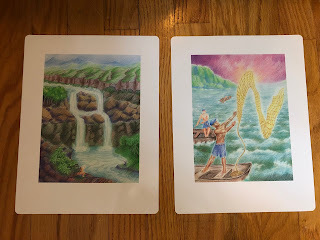 We looked at the River illustration in L M N O P and All the Letters A to Z and read the R poem. Then he started talking about fish -- which was a perfect transition to our next letter -- and he carefully listed all the ways you could catch fish (with a fishing rod, with your hands). So I showed him the Net illustration in LMNOP and he said, oh, I didn't know you could use a net! 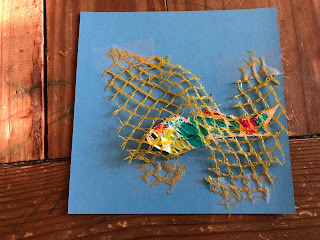 We did the Making Shiny Fish project using a fish pattern from Feltcraft by Petra Berger. I showed him how to use tracing paper to trace the pattern; then we cut it out and laid it over the aluminum foil and made the fish shape out of foil. Then we placed a piece of the net bag from onions underneath and rubbed it to get the scale texture on our little fish. Then he colored it with Sharpies (fine tip is better ultra-fine which tears the foil). 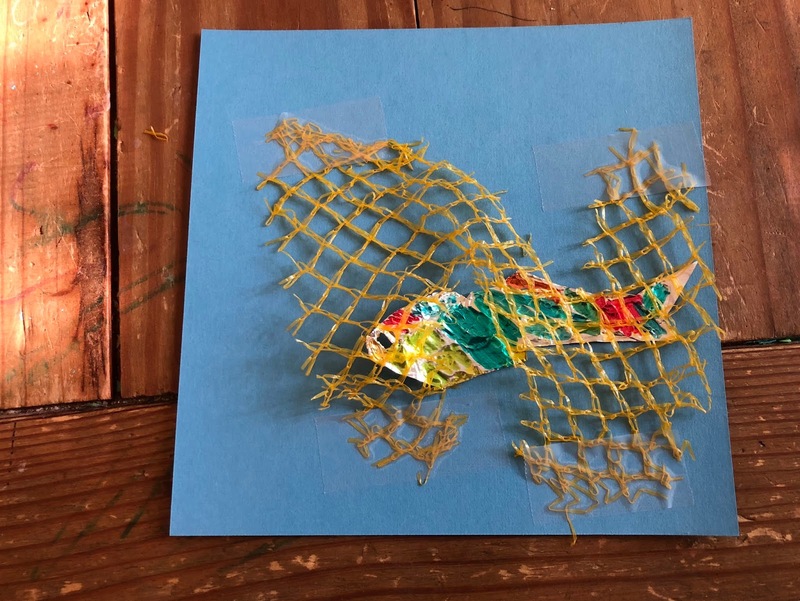 We used a few dots of liquid glue to glue it to our piece of blue card stock, which is already cut to fit in our MLB, and then I cut the piece of net bag into the shape of an N and we laid it overtop to "catch" the fish, and taped it in place with clear tape. We ended our session by beginning a potholder. Tracing, cutting, gluing, and weaving are all excellent fine motor skills. "I Wanted to Have Something Real"